Today’s theme is Transparency and Representation: Copyright policy must be set through a participatory, democratic, and transparent process. It should not be decided through back room deals, secret international agreements, or unilateral attempts to apply national laws extraterritorially. Transparency is critical in understanding what laws may be created that will affect the public. For years, the United States has been involved in negotiated trade agreements in secret, without giving the public ample opportunity to make comments and engage in a meaningful way. ARL has blogged about the concerns around the lack of transparency in trade negotiations many times in the past, noting that this is a primary failing of the negotiations of the Trans-Pacific Partnership Agreement (TPP), Trans-Atlantic Trade and Investment Partnership (TTIP) and other agreements, resulting in a lack of democratic process. Although USTR has claimed transparency due to the opportunities to provide stakeholder presentations at various negotiations round, the secrecy of the negotiating texts and proposals made it impossible to actually give meaningful engagement. Unlike the EU, for example, in the TTIP negotiations, USTR has not released draft textual proposals. In 2016, ARL joined a coalition making critical recommendations for the United States Trade Representative Open Government Plan. Publish U.S. textual proposals on rules in ongoing international trade negotiations: USTR should immediately make available on its website the textual proposals related to rules that it has already tabled to its negotiating partners in the context of the TTIP, TiSA, and any other bilateral, regional, or multilateral trade negotiation it undertakes. Publish consolidated texts after each round of ongoing negotiations: USTR should impose as a prerequisite to any new or continuing trade negotiations that all parties agree to publish consolidated draft texts on rules after each negotiating round. Appoint a “transparency officer” who does not have structural conflicts of interest in promoting transparency at the agency. These are the critical steps that USTR should take in negotiating trade agreements, whether the government is negotiating new agreements or, as President-elect Trump has promised to do, revisiting old agreements. The textual proposals are key to understanding what is being negotiated. While fact sheets may be useful, they are no substitute for the actual language of the texts which are highly technical and nuanced. As noted in ARL’s analysis of the final TPP text, there were significant improvements in the text from earlier proposals. Some of these improvements may have been made possible through the input of civil society and academics, but these comments were only possible due to access to leaked text. This entry was posted in Uncategorized and tagged copyright week, eff, TPP, trade, transparency, TTIP on January 18, 2017 by Krista Cox. 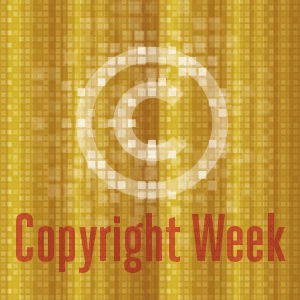 We’re taking part in Copyright Week, a series of actions and discussions supporting key principles that should guide copyright policy. Every day this week, various groups are taking on different elements of the law, and addressing what’s at stake, and what we need to do to make sure that copyright promotes creativity and innovation. Today’s topic is “Transparency: Copyright policy must be set through a participatory, democratic and transparent process. It should not be decided through back room deals or secret international agreements. Transparency in government is fundamental to a democratic society and meaningful participation. Without access to information about the laws and policies being considered, the public is unable to substantively comment and address potential areas of concern or challenge and influence public policy. The negotiations of the Trans-Pacific Partnership Agreement (TPP) which took place over the course of more than five years before a final agreement was reached in October 2015, highlight a poor exercise in transparency. Over the course of the lengthy negotiations, the official text was never released nor was it released when the trade ministers of the twelve negotiating parties announced conclusion of the agreement. It was not until December 2015 that any of the parties released the text for the public to view. While there were several leaks of various portions of the agreement, including quite a few leaks of the intellectual property chapter, relying on leaks is a poor substitute for official releases of text. By the time a trade agreement reaches its conclusion, it is very difficult, if not impossible to change the text (particularly given the number of negotiating parties in the case of the TPP) and it is therefore important that the public is engaged at an earlier date. Throughout these negotiations, USTR and other negotiating governments often made claims that the process was a transparent one. They touted the fact that they provided information about the locations of negotiating rounds and invited stakeholders to give presentations on a “stakeholder engagement” session and attend briefings by the chief negotiators. However, this form of engagement is not a substitute for seeing the actual text. Furthermore, the last time stakeholders were provided an official opportunity to present to the negotiators was in August 2013, despite the fact that negotiations continued for more than two years after. Increase Transparency of Trade Policy and Negotiations. In September 2015, the Administration appointed a Chief Transparency Officer in the Office of the United States Trade Representative who will take concrete steps to increase transparency in trade negotiations, engage with the public, and consult with Congress on transparency policy. This work builds on previous steps to increase stakeholder engagement with trade negotiators, expand participation in trade advisory committees, and publish more trade information online. To further increase public access to U.S. trade policy and negotiations, the Office of the United States Trade Representative will also continue to promote transparency and public access to international trade disputes in the World Trade Organization and under regional trade agreements, and encourage other countries to similarly increase transparency in this regard. The Office of the United States Trade Representative will also continue to encourage posting video of trade dispute hearings to give the public insight into these processes. While increased transparency is always welcome, in the case of the TPP, this goal comes too late. Furthermore, the initiative may also be too little as the specifics of the plan reveal that the government is not committing to the transparency necessary for the public to engage in informed debate. While increased stakeholder engagement with negotiators would certainly be welcomed, there is no commitment to releasing the actual negotiating texts. Furthermore, the “expand[ed] participation in trade advisory committees” may not be that useful given that under the current rules of the trade advisory committees, individuals are required to sign non-disclosure agreements. The text of the copyright provisions of the TPP improved over the course of the negotiations. Many areas of concerns raised by critics of the agreement once leaked text was available were addressed, possibly because of the outcry over these provisions. Yet, again, relying on the availability of leaked text is risky and the public should be given an opportunity to comment on issues that will affect them, within a timeframe where such criticisms can be addressed. Backdoor policymaking has no place in a democratic society. As the TPP negotiations have concluded (though it must still be signed and ratified by each of the negotiating parties), attention will turn to another regional trade agreement: the Trans-Atlantic Trade and Investment Partnership (TTIP) with the European Union. The EU has made steps toward increased transparency in the negotiations. In November 2014, the European Commission announced that it would publish the dates, locations, names and organizations it meets with and the topics of its discussions. Specifically, the Commission agreed that with respect to the TTIP it would make public the negotiating texts it shares with Member States and Parliament, provide all Members of the European Parliament the TTIP texts, make less negotiating documents classified, and publish a public list of TTIP documents that have been shared with the European Parliament and Council. The United States should improve its commitments to increased transparency in trade negotiations and make their proposals public. Descriptions about negotiating texts and engagement with stakeholders are no substitutes for the ability to view and comment on the actual texts. Often, the language included in these agreements are highly technical and commentary and concerns can change based on the exact text. The goal of increasing transparency should be applauded, but meaningful transparency must be achieved. This entry was posted in Uncategorized and tagged copyright, copyright week, TPP, trade, transparency, TTIP on January 22, 2016 by Krista Cox. 1201 Rulemaking for a New Era? Every three years, the Copyright Office facilitates a rulemaking process, which considers potential exceptions to the Section 1201 prohibition of circumvention of technological protection measures (TPMs) under the 1998 Digital Millennium Copyright Act (DCMA). During this process, the Register of Copyrights conducts the rulemaking proceeding and consults with the National Telecommunications and Information Association (NTIA), making a final recommendation to the Librarian of Congress. In plain terms, this means the Copyright Office considers petitions for exemptions that allow for things like professors using video clips from Blu-Ray discs when teaching their classes, or for the print-disabled to make e-books accessible. The Office is currently undertaking a study to consider the practical application of Section 1201, including the triennial rulemaking process, to see what improvements might be made. In the largest proceeding thus far, the 2015 Triennial Rulemaking also ranged quite far from the area of copyright, considering matters that would fit better at proceedings run by agencies like the Department of Transportation or the Environmental Protection Agency. For example, one class of works proposed for an exemption included computer programs that control motorized land vehicles, including those in cars, which if adopted would allow owners to circumvent TPMs in order to make repairs or modifications to those programs. The copyright implications of circumventing the TPMs in this software, while present, pales in comparison to implications for auto manufacturers, the Department of Transportation, and most importantly the users attempting to “tinker” with their lawfully-purchased vehicles. Although the section 1201 rulemaking process is legal theatre, the cost of admission is extremely high, particularly for nonprofit organizations. An entity seeking an exemption must: 1) assemble the evidence to support an exemption; 2) prepare a written request that includes the text of the proposed exemption, an argument in favor of the exemption, and a recitation of the relevant facts; 3) prepare a written reply to oppositions to the request; 4) participate in a hearing in Washington D.C.; and 5) prepare a written response to the Copyright Office’s follow-up questions. From start to finish, the process can take more than a year. In addition to being burdensome, expensive, long and often frustrating, this process is often confusing to the public that it is meant to benefit. The language of the exemptions that result from each rulemaking has become incredibly intricate and detailed. The beneficiaries of these exemptions may not be sure they are using the exemptions correctly, and thus would not be able to put stock in the legality of their activities. So much for “you bought it, you own it” victories won in this arena being easily applicable in the real world. A question from the Copyright Office of particular interest to the library community asks commenters to “assess whether there are other permanent exemption categories that Congress should consider establishing – for example to facilitate access to literary works by print-disabled persons?” This particular exemption has been granted in every rulemaking* since 2003, and in the 2015 Rulemaking, this petition was met without opposition. This is precisely the kind of exemption that should not have to go through this arduous process anew every three years. The House Committee Report that accompanied codification of the fair use doctrine in the Copyright Act of 1976 expressly stated that making copies accessible “for the use of blind persons” posed a “special instance illustrating the application of the fair use doctrine” . . . . The Committee noted that “special [blind-accessible formats] . . . are not usually made by the publishers for commercial distribution” . . . . We believe this guidance supports a finding of fair use in the unique circumstances presented by print-disabled readers. As LCA noted, “[t]he fact that every three years the blind need to expend scarce resources to petition the Librarian of Congress to renew their exemption . . . demonstrates the fundamental flaw in section 1201.” This, and other exemptions that have been continuously renewed, provide ample fodder for comments on expanding the current permanent exemption class. The Copyright Office is accepting comments through February 25, and reply comments through March 25. More information on participation and specific will be posted on the Office’s website by early February. Comments urging the Office to rethink the Rulemaking in order to preserve the resources wasted on a repetitive process and making the exemptions easier for the beneficiaries to understand will help to ensure that non-infringing lawful use can continue. *During the 2010 rulemaking process, the Register of Copyrights recommended that the exemption for those with print disabilities be denied despite the fact that the NTIA recommended renewal. The Librarian of Congress, however, overruled the Register of Copyrights and granted the exemption. This entry was posted in Uncategorized and tagged 1201, copyright week, dmca on January 20, 2016 by Krista Cox. In support of today’s theme, Jonathan Band and Caile Morris have created a document, entitled “Nothing New Under the Sun” providing examples of famous creators throughout the history of art who have built their works on existing works. The purpose of the document is to demonstrate the importance of copyright limitations to the creative process. Proponents of strong copyright protection stress the significance of an author’s contribution to the artistic and economic value of a work. In this vision, creativity starts with an author’s spark of genius and is realized through the artist’s talent and hard work. To be sure, great works reflect their authors’ genius, talent, and hard work. But authors do not create in a vacuum. The raw material for their creativity is existing works. Artists borrow themes, styles, structures, tropes, and phrases from works that inspire them. And if copyright overprotects existing works—if it restricts authors’ ability to build on the creative output of authors who came before them—it will be more difficult for authors to create. Unfortunately, copyright owners and policymakers often undervalue the importance of this use of source material. They focus on rights, but not on the critical limitations to those rights that enable creativity to flourish. These limitations include: the idea/expression dichotomy and the related doctrines of merger and scenes a faire; fair use; and copyright term, which results in works entering the public domain. The failure to recognize how essential limitations are to new creative expression results in bad policy, such as the Sonny Bono Copyright Term Extension Act (adding 20 years to the copyright term) or the absence of mandatory exceptions and limitations in free trade agreement. Hopefully, these examples of great works derived from earlier works will remind copyright owners and policymakers of the importance of copyright limitations and exceptions to the creation of new works. This entry was posted in Uncategorized and tagged copyright term, copyright week, fair use, limitations and exceptions, public domain on January 19, 2016 by Krista Cox. The current copyright term in the United States goes well beyond the international standard of life of the author plus fifty years and is now set at life of the author plus seventy years, or ninety-five years for corporate works. This term is unacceptably long and does significant damage to the public domain, depriving the public of a storehouse of raw materials from which individuals can draw from to learn and create new ideas or works. Each year, Duke’s Center for the Study of the Public Domain does a roundup of everything that could have entered the public domain if the term prior to the 1976 act, which was set at twenty-eight years plus another twenty-eight years if renewed. The term has been changed twice since then, once by the 1976 Copyright Act which set the term at life of the author plus fifty years, then again in 1998 to the current term. The list of works that failed to enter into the public domain as a result of these two changes to the copyright term is always an impressive one. This year’s highlights include works like T.H. White’s The Once in Future King, Chinua Achebe’s Things Fall Apart; or Michael Bond’s, A Bear Called Paddington. These works will go into the public domain in 2054. Notably, because of the Copyright Term Extension Act, the public domain has essentially been frozen; works under copyright at the date of implementation of the act in 1998 retained their copyright. The public domain will not see any new works due to expired copyrights until 2019. The United States’ copyright term is unacceptably long and does not represent the international standard. Most countries in the world adhere to the Berne Convention standard of life of the author plus fifty years. In fact, where copyright term exceeds this international standard, there have been calls to reduce the term. Many stakeholders, including the Library Copyright Alliance, called for a reduction of copyright term in submissions for the EU Copyright Consultation. The draft report on the Evaluation of the EU Copyright Directive was recently released and “Calls on the Commission to harmonise the term of protection of copyright to a duration that does not exceed the current international standards set out in the Berne Convention.” If accepted, harmonization of copyright term would actually result in a reduction of term for many countries to life plus fifty years. Economic evidence is clear that the likely deadweight loss to the economy exceeds any additional incentivising effect which might result from the extension of copyright term beyond its present levels. This is doubly clear for retrospective extension to copyright term, given the impossibility of incentivising the creation of already existing works, or work from artists already dead. Despite this, there are frequent proposals to increase term . . . The UK Government assessment found it to be economically detrimental. An international study found term extension to have no impact on output. Such lengthy copyright terms make little sense, particularly in light of today’s digital environment. Works are often published on the Internet, resulting in increasingly ephemeral content. Such content may have little to no economic value to the copyright owner, yet still remains under copyright protection until seventy years after the author has died. Policymakers should carefully consider the economic evidence and rationale before extending copyright terms and diminishing the public domain. This entry was posted in Uncategorized and tagged berne convention, copyright, copyright term, copyright week, CTEA, economic evidence, public domain, term extension on January 24, 2015 by Krista Cox. Tomorrow, intellectual property negotiators will begin meeting in secret to discuss the Trans-Pacific Partnership Agreement (TPP), a large regional trade agreement that currently has twelve negotiating parties: Australia, Brunei, Canada, Chile, Japan, Malaysia, Mexico, New Zealand, Peru, Singapore, Vietnam and the United States. As noted in last year’s post for Copyright Week’s Transparency Day, transparency in policymaking is essential to upholding democratic ideals. Without access to information about the negotiations and texts, the public is unable to substantively comment and address areas of concerns. Despite the fact that the TPP has been negotiated for the past five years, none of the negotiating parties has officially released proposals or text. The only texts that have been made available resulted from leaks, the most recent occurring on October 16, 2014. There have been many areas of concern with respect to the copyright provisions in the TPP. While the most recent leak shows improvements in some areas (such as eliminating the three-year rulemaking procedure for creating exemptions to anti-circumvention laws), it also revealed new potential issues (such as possibly preventing the reintroduction of copyright formalities for the last twenty years of copyright protection in the United States). Yet the public is only alerted to these potential problems by relying on leaks, which do not occur on a regular basis. Furthermore, while governments made information about earlier rounds of negotiations public and stakeholders were invited to give presentations or interact with negotiators, recent meetings have become more secretive. The last time stakeholders were provided the opportunity to present was in August 2013 even though negotiations have continued on a regular basis since then. The website of the Office of the United States Trade Representative does not give any details or even acknowledge the meetings that will take place over the course of the next two weeks. As the TPP is reportedly in its final stages, it appears that negotiations with the European Union on a regional trade agreement known as the Trans-Atlantic Trade and Investment Partnership (TTIP) seems to be quickly advancing. After several rounds of negotiations, texts have already been proposed in some areas. Unlike the negotiations in the TPP, however, much more information has been publicly released on the TTIP. In November 2014, the European Commission announced that it would publish the dates, locations, names and organizations it meets with and the topics of its discussions. Specifically, the Commission agreed that with respect to the TTIP it would make public the negotiating texts it shares with Member States and Parliament, provide all Members of the European Parliament the TTIP texts, make less negotiating documents classified, and publish a public list of TTIP documents that have been shared with the European Parliament and Council. Secrecy is a poor model for policymaking. Even when an agency or government asserts that it is transparent because it has released statements or described what proposals have been made, as noted in a letter commenting on proposed text in the TPP, “informed commentary is possible only with respect to actual text, not descriptions of text.” The specific language, structure and details of a proposal are critical in understanding the potential impacts. USTR should consider following the lead of the EU and release its negotiating proposals in the TTIP as they become available. Similarly, TPP countries should agree to release the negotiating texts to allow for informed participation. Releasing the negotiating texts of trade agreements has precedent; the text of the Free Trade Area of the Americas was released and the US government solicited comment on the negotiating text. Library associations noted their appreciation for the open process for commenting on the Free Trade Area of the Americas. Participation in the democratic process is dependent on access to information; without being able to read the texts these values are threatened. Of course, even if the TPP text is released, another danger remains: Congress may choose to give the Obama Administration “trade promotion authority” also known as “fast track authority.” If “fast track” is approved Congress will not have the ability to change the agreement and can only approve or reject the agreement on a straight up-down vote, meaning that it cannot amend the agreement. Agreements that have reached Congress through fast track authority have never been rejected. This delegation of authority further threatens democratic principles by reducing the ability of elected officials to meaningfully address concerns that may arise from portions of the agreement. This entry was posted in Uncategorized and tagged copyright, copyright week, TPP, trade, transparency, TTIP, wikileaks on January 22, 2015 by Krista Cox.